The plot of Stand Your Ground is a story we've unfortunately heard too often recently in national news. "A black teenage boy is dead. A white man shot him. Was he standing his ground or was it murder?" Seventeen-year-old Marquis Johnson was shot and killed yet the shooter has not been arrested. His mother Janice wants to trust the DA and police to do the right thing but her husband Tyrone and his family have joined the public outcry of protestors seeking justice. Backed by the vigilante group Brown Guardians, actions are taken. Meredith Spencer is married to the shooter, Wyatt Spencer. Despite what the news reports, Meredith sees the situation clearly. She struggles whether to tell what she knows considering it will affect the case, her life and her son. Hopefully Meredith will find the courage to come forward. Stand Your Ground is the new release by bestselling award-winning author Victoria Christopher Murray. She touched close to the heart with this one. It touches on race, motherhood, vigilante justice and marriage. I was engaged from literally the first line to the very last word printed on its pages. I felt so many emotions and empathy toward both mothers, Janice and Meredith, as I read from alternating points of view. I especially felt for the parents of Marquis and their impasse on who to trust to bring justice to their murdered teenage son. Kudos to Victoria Christopher Murray for naming the lead detective "Ferguson" and incorporating the Brown Guardians into the story. It reminded me of my and Chickadee's brief days as Guardian Angels wearing red berets patrolling the streets of New York boroughs and Detroit's Eastern Market. Like the real world, Twitter was Janice's main source of news in the aftermath of Marquis' shooting. The author suggests that book clubs search for mentions of Trayvon Martin, Michael Brown, Eric Garner and Tamir Rice. 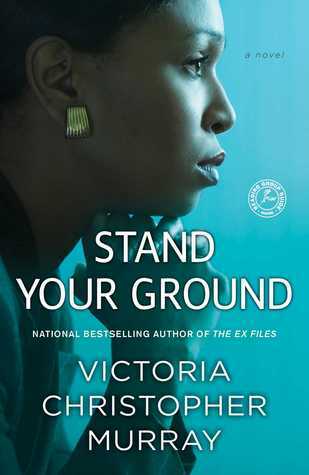 I don't know what is next for the author but even she admits her writing will never be the same after writing Stand Your Ground. As a reader, this fictional story will never be forgotten, certainly earning a spot in my top books read of 2015.